Ginsu's serrated blades perform as accurately as fine edged professional cutlery with the added convenience of never needing to be sharpened! Add these steak knives to your cutlery set to ensure you'll be prepared for surprise dinner guests! These Ginsu Essential Steak Knives arrive sharp and NEVER NEED SHARPENING giving you a no-maintenance set of knives at a great price. Every Ginsu Essential Steak Knife features Scalloped Serration designed with your dining needs in mind so you can serve any entrée with the confidence that you have the best knives to enjoy your meal. 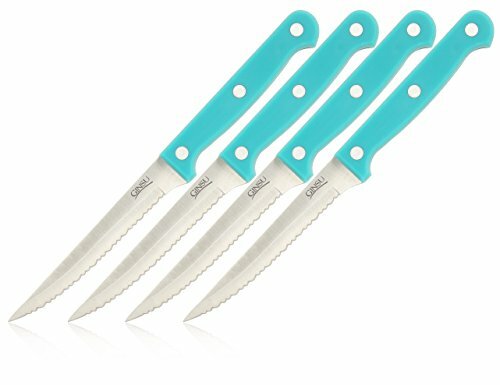 These Full-Tang, Triple Rivet Ginsu Essential Knives are ergonomically engineered to give you a comfortable and safe dining experience. Like all of Ginsu's Essential, Koden, and Chikara Series Knives and Knife Block Sets, this product is backed by a Lifetime Limited Warranty. If you have any questions about this product by Ginsu, contact us by completing and submitting the form below. If you are looking for a specif part number, please include it with your message.